With so many new restaurants sprouting up every day, we are tempted to try out new cuisines and new foods. One of the most common health problems one might face while exploring new restaurants at a new place would be worm infestation. You could be totally unaware of it till you start experiencing the symptoms. Didn't expect it, right? Yes, in a tropical and developing country like ours where hygiene is not given priority by cooks and food handlers at small setups, worm infestation is common. The main modes of transmission are the faeco- oral route, pests, flies and rodents. The common parasites that humans are susceptible to are pin worms, round worms, tape worms, hook worms and thread worms. Worm infestations can cause serious health problems both in children and adults when left untreated. It can lead to severe anaemia and other nutrient deficiencies. They can be identified through routine stool and blood tests. These instances can be avoided by a having a de-worming course. 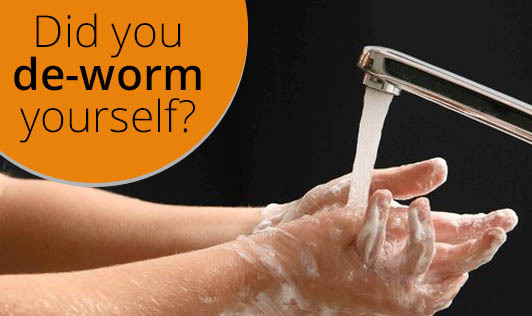 So how often should you de-worm yourself? Doctors suggest that de-worming once in six months can keep you away from any kind of infestations. And most of the de-worming medications do not have any side effects. Consult with your primary physician for a suitable de-worming tablet before you take the tablet of your choice and prevent worm infestation. You can get de-worming done for the entire family periodically.